Children with cancer dream of growing up! You can make their dream a reality. Support ACCO to provide treatment information, family support and advocacy initiatives to make childhood cancer a national child health priority. I can't thank the American Childhood Cancer Organization enough, for what you do for our children and our families. As you know, when a family gets that heart-wrenching diagnosis that their child (or in our case, our 4 month old baby girl), has cancer, we feel as if we have no where to go, no where to turn. BUT, when I searched, I found your organization and it has brought great peace and joy into my life. In the midst of our despair, we found information and hope. I trust that one day I may be able to help bring smiles and warmth to another family, like many of you did for us. 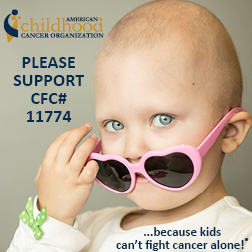 Support the American Childhood Cancer Organization (formerly Candlelighters) through your CFC donation so that we can continue to provide essential treatment information, support, cutting edge research, and HOPE to children with cancer and their families. ... because kids can't fight cancer alone!